On the 15th (Sat), contemplate the long history of Pittock Mansion, take in nature's colorful creations at International Rose Test Garden, then identify plant and animal life at Hyland Forest Park, and finally hike along Forest Park. To find maps, reviews, photos, and other tourist information, read our Portland road trip site . Baltimore to Portland is an approximately 8-hour flight. You can also do a combination of train and flight; or drive. The time zone changes from Eastern Standard Time (EST) to Pacific Standard Time (PST), which is usually a -3 hour difference. Traveling from Baltimore in June, things will get slightly colder in Portland: highs are around 77°F and lows about 56°F. You'll have a few hours on the 16th (Sun) to wrap things up before traveling to Hood River. The city of Hood River is the seat of Hood River County, Oregon, United States. 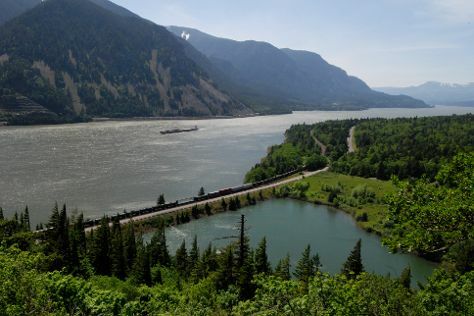 Start off your visit on the 16th (Sun): contemplate the waterfront views at Columbia River Gorge National Scenic Area. For ratings, other places to visit, where to stay, and more tourist information, refer to the Hood River road trip planning tool . Traveling by car from Portland to Hood River takes 1.5 hours. Alternatively, you can take a bus; or take a train. Traveling from Portland in June, you will find days in Hood River are a bit cooler (72°F), and nights are about the same (55°F). 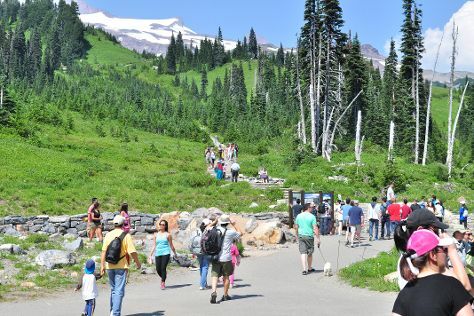 Finish your sightseeing early on the 17th (Mon) to allow enough time to take a train to Mount Rainier National Park. On the 17th (Mon), take in the dramatic scenery at Comet Falls and then take in the awesome beauty at Mount Rainier. On the 18th (Tue), you'll have a packed day of sightseeing: get engrossed in the history at Longmire Museum, then admire the sheer force of Narada Falls, and then hike along Skyline Trail. To see reviews, ratings, maps, and tourist information, use the Mount Rainier National Park trip builder tool . Traveling by train from Hood River to Mount Rainier National Park takes 6 hours. Alternatively, you can do a combination of bus and train; or take a bus. Plan for slightly colder nights when traveling from Hood River in June since evenings lows in Mount Rainier National Park dip to 50°F. Cap off your sightseeing on the 19th (Wed) early enough to catch the train to Seattle. Start off your visit on the 19th (Wed): take a stroll through Pike Place Market, take in the waterfront at Hiram M. Chittenden Locks, then explore the world behind art at Chihuly Garden and Glass, and finally stroll through Alki Beach. To find reviews, photos, maps, and other tourist information, you can read our Seattle trip planner . Traveling by train from Mount Rainier National Park to Seattle takes 2 hours. Alternatively, you can take a shuttle; or take a bus. Plan for a bit warmer nights when traveling from Mount Rainier National Park in June since evenings lows in Seattle dip to 57°F. Finish your sightseeing early on the 20th (Thu) so you can drive to Coeur d'Alene. Coeur d'Alene is the largest city and county seat of Kootenai County, Idaho, United States. Start off your visit on the 20th (Thu): admire the architecture and history at Old Mission State Park, look for all kinds of wild species at Tubbs Hill Nature Trails, and then stop by KnitKnit. Get ready for a full day of sightseeing on the 21st (Fri): explore the landscape on two wheels at North Idaho Centennial Trail and then grab your bike and head to Trail of the Coeur d'Alenes. To find traveler tips, maps, and more tourist information, go to the Coeur d'Alene day trip planner . Traveling by car from Seattle to Coeur d'Alene takes 5.5 hours. Alternatively, you can fly; or do a combination of flight and bus. Traveling from Seattle in June, you can expect nighttime temperatures to be a bit cooler in Coeur d'Alene, with lows of 51°F. Cap off your sightseeing on the 22nd (Sat) early enough to go by car to West Glacier. West Glacier is an unincorporated community and census-designated place (CDP) in eastern Flathead County, Montana, United States. Visiting River Rafting & Tubing and Avalanche Lake will get you outdoors. Venture out of the city with trips to Glacier National Park (Jackson Glacier Overlook, Going-to-the-Sun Road, & more). For reviews, more things to do, maps, and tourist information, refer to the West Glacier trip builder app . Traveling by car from Coeur d'Alene to West Glacier takes 5.5 hours. Alternatively, you can take a train. You'll lose 1 hour traveling from Coeur d'Alene to West Glacier due to the time zone difference. Traveling from Coeur d'Alene in June, plan for little chillier nights in West Glacier, with lows around 45°F. Finish your sightseeing early on the 24th (Mon) so you can travel back home.